One of my colleagues recently told me about something he was watching someone next to him eat at one of his go to Mexican restaurants. As you may be aware, my go to at any Mexican restaurant is tacos or a torta, hands down. But what he was describing was intriguing to say the least. 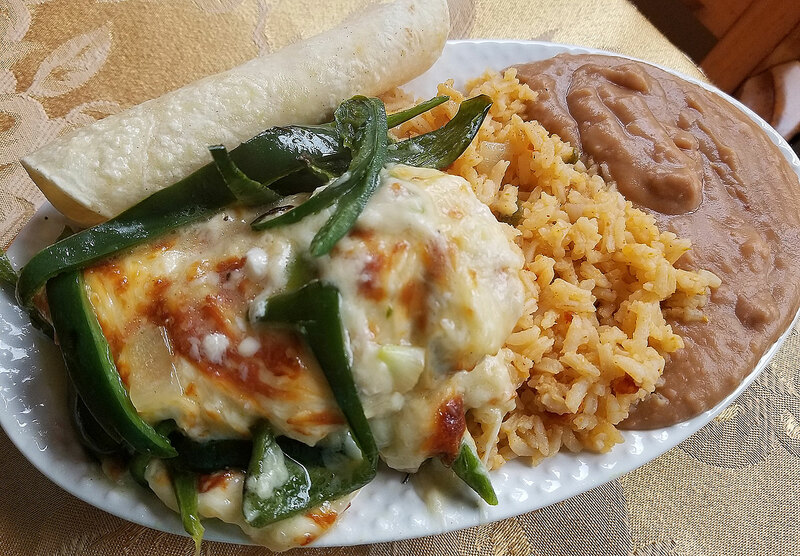 Chicken smothered in cheese and loaded with thinly sliced onions and poblano peppers. What was I supposed to do when I could not shake that thought off my mind? You got it, I went to this place (Casa de Alberto), ordered this dish and was so blown away that I had to recreate it, and I nailed it. This dish is not only way too easy to make, but my wife actually sent me a text as she has been eating the leftovers, that it is one of her new favorites. It’s not only about the cheese, or simplicity, but the combination of all of the ingredients. Heating a large skillet on medium to high heat. Add in one tablespoon of the canola oil and swirl that around. Season the chicken with salt and pepper. Add the chicken to the skillet and cook for a few minutes on each side. To another skillet, add the remaining canola oil on medium heat. Add in the onions and poblano peppers and cook just until slightly tender. You still want a bit of a crunch to them. Remove from the heat and top them to the top of the chicken. Add the cheese, covering the chicken and peppers and place into the oven. Cook for about 15 minutes or until the cheese is completely melted. Remove the skillet from the oven (make sure you have your oven mitt), and get ready to plate. Using a spatula or large spoon, dig out some chicken, peppers and onions, and serve with the cooked refried beans, rice, and tortillas. This dish is a stunner. That cheese alone will rock your world, but all together, this is one fantastic dish. Hope you enjoy!